Kitty Climbs Up On The Swing, But Watch What Happens When You Hear His Tail… TOO Funny!! And just take a look at this smart, but hilarious idea. They place a small Japanese taiko drum next to Maru’s tail, which he flicks and hits the drum in time with a traditional Japanese song. This is too funny! Kitty doesn’t seem to mind at all and enjoys swinging and drumming along. Watch what happens here, it’s great. 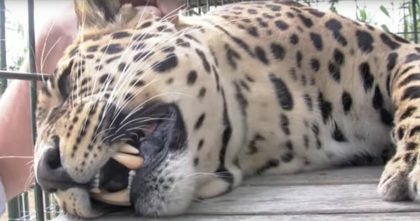 Watch The Reaction When A Human Reaches His Hand In To Pet This Massive Rescue Leopard… Awwwww! 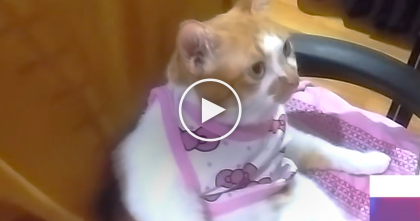 She’s Watching Something On The Screen… Now Watch The Cats Reaction, This Is Hilarious!! 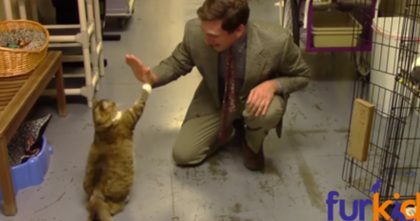 Animal Shelter Comes Up With Genius Commercial To Help Cats Get Adopted… It’s HILARIOUS! 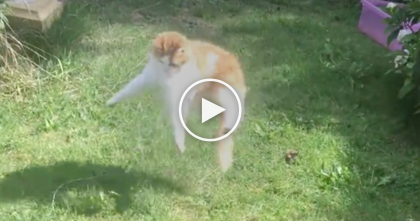 Watch This Cats Reaction When He Plays With His Owner… FUNNIEST Thing Ever, Hahaha!! 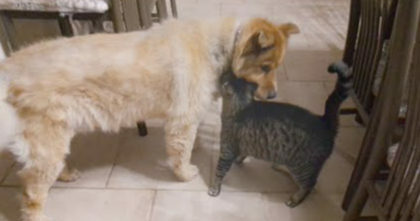 Watch The Reaction When Kitty Is Finally Reunited With Blind Doggie Friend… SOO Sweet! !